The Feast of Dedication (Hanukkah, Dec 2-10, 2018) tells a story of the goodness of God. History records the tiny Maccabee army’s miraculous victory over the powerful Seleucid (Syrian–Greek) army. After this victory the Maccabees began cleansing the defiled Temple of God and located just one pure jar of oil to light the menorah. One jar would burn one day. The jar of oil was lit and miraculously burned for 8 days which was the time needed to prepare more pure oil. God’s supernatural, loving provision protected one jar of pure oil during the desecration of the Temple. The miraculous occurred when the oil burned for 8 days. About 600 years after these events a recorded account of the oil miracle appears in the Talmud. The Talmud is a collection of rabbinic discussions, historical accounts and legends. It is not the inspired Word of God. Traditional Judaism generally regards the story of the Hanukkah oil as accepted fact, but this is not Scripture. However, Yeshua observed Hanukkah along with the other Jewish people of His day as recorded in John 10:22-23. Yeshua is the light to the nations. As the temple of the Holy Spirit we can celebrate the Feast of Dedication by rededicating our temple to Him and allowing His light to burn continually in us – which others will see, recognize the Light of the World and follow Him. PRAYER: Lord, we rededicate this temple to You. Let your light shine brighter as we are continually filled with the Holy Spirit. Let our lives illuminate the goodness of God. Stir our hearts and use us to serve Jewish people in our local community through fellowship and acts of compassion. Holy Spirit, ignite us with prayer for the needs of Jewish people internationally and in Israel. We want to stand strong in the increasing attacks against Jewish people and we fight battles through prayer. You fight the battles in Your power and might, and there are miraculous victories. Thank you for the miracles you have done in the past. Thank you for being with us today in miraculous ways. PRAYER: Lord, we ask you to bless our ministry partners. Give them favor. Let your face shine on them and give them your shalom. For the young people who serve alongside their missionary parents, let them know how important they are to your Kingdom work. Develop their gifts and anoint them for service. Please continue to bless and protect our families who live far away, especially those serving in the military and in other risky occupations. It is our privilege to pray for your needs. 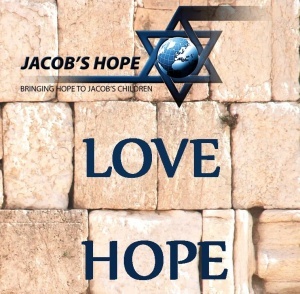 Jacob’s Hope Brochure – Download a PDF Copy – Click image below. Director, Brent Johnson, end of year greeting.